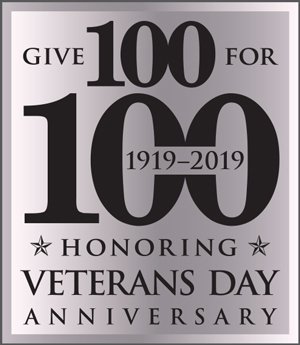 In honor of the 100th anniversary of Veterans Day, VOC is kicking off 2019 with a challenge to pledge 100 for 100 years. A gift of 100 (dollars, quarters, dimes, nickels, even pennies) could provide meals for a veteran and family, bus passes to work, warm clothes, shelter on a cold winter night and so much more. Your gift, no matter the amount, means so much to the veterans in our community. Veterans Day originated as “Armistice Day” on Nov. 11, 1919, the first anniversary of the end of World War I. Veterans Day pays tribute to all American veterans—past and present—but especially gives thanks to living veterans who served their country during war or peacetime. We are grateful for your partnership as we work to serve those who serve U.S.